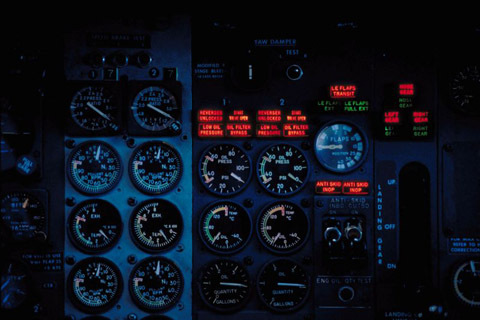 Flight instruments have come a long way in the past ten years. It started in experimentals and now has worked it's way into certified planes. First was GPS, which changed the way we navigate. Next came the "glass" panel display, which replaced many of the old round instruments that we all learned as student pilots. I have been happy with the "glass" panel that I installed in the RV-9A. This plane, however will be IFR capable, so naturally it will have more "stuff." These are the basic "systems". Click on any of these to go directly to that section. The central focus of the instrument panel will be a set of two electronic displays from Advanced Flight Systems. I have followed the progress of this product for the several years. Rob Hickman and his team of engineers have put a lot of effort into this product and it shows. I am going with two of the AF3500 8.4" displays. These units interconnect using an ethernet cable, so they can share information. One of the displays will have the AHRS and magnetometer hublot replica, and the other will have the engine monitoring circuitry. 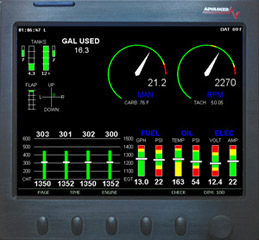 The engine data will display on either screen, as will the EFIS information. I have also purchased the moving map software, which allows one screen to be put in full-screen map mode. It is easy to become frustrated with the small screen on the Garmin 496. An 8.4" moving map should be a vast improvement. It will display a map with airports and cities and all the goodies of a typical GPS. It will also display rolex replica traffic from the GTX-330 transponder and weather data if I elect to add that feature later. Currently the map software will only allow me to create a single leg (direct to) flight plan, but they are working on expanding the features. The displays will also connect to the Garmin SL-30 to display the VOR/Glideslope/Localizer needles. This information is superimposed on the artificial horizon. 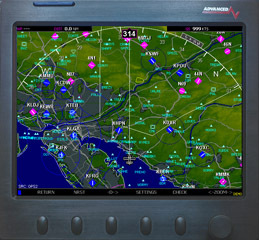 Autopilot - Send navigation information and essentially "fly the plane"
Advanced Flight Systems has had a first rate engine monitor for many years now, and the AF3500 EFIS takes advantage of this heritage. One of my pet peeves of flying older spam cans is that you can't see the engine gauges while you're flying, and if you did happen to glance at them you wouldn't know what they meant replica watches. With an electronic system constantly monitoring the engine, you can know immediately if there is something unusual happening. You can set limits on virtually every parameter, so you are warned when those limits are exceeded. I also like that the engine information can be superimposed graphically along the bottom of the EFIS display.